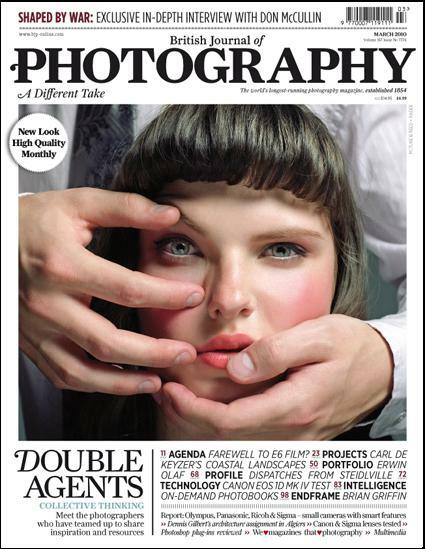 The British Journal of Photography has relaunched its print magazine with a return to a monthly format from 3 March. The revamp will be backed by an aggressive subscription drive and a push to increase copies on international news stands, says the title. “We believe that print magazines have a positive future, so when we began thinking about what we could deliver as a monthly, we decided to play to the strengths of print. While many magazines are cutting costs and chasing readers that now have an allegedly shorter attention span, we are investing, rewarding them with a redesigned magazine that uses higher quality paper, has superior reproduction techniques and delivers more depth,” says editor Simon Bainbridge in a release. This entry was posted in Magazines and tagged bjp, Simon Bainbridge, The British Journal on February 26, 2010 by Laura Oliver. The British Journal of Photography in partnership with the Association of Photographers is calling for entries for its fifth annual award. There are two award categories this year: one recognising a single outstanding image; the other an exceptional body of work. Anyone of any country can enter and there is no theme. Photographs can be captured in any format, film or digital, and can be of any style or genre. The prize fund is worth more than £13,000 with the winner of the single image category receiving a SIGMA DP2 professional compact camera and the winner of the body of work category receiving a LEAF CAMERA (the exact model TBC). The winning work of both categories will be given a solo show at a leading London photography gallery, printed by one of Europe’s top fine art laboratories. Both winners will also feature in the British Journal of Photography. Entry is £25 for the series category, and £5 per single image. Photographers are welcome to enter both competitions, and to enter more than one body or work or image. The deadline is September 11 2009. Full details of how to enter and the criteria are available at this link. This entry was posted in Events, Photography and tagged Association of Photographers, Awards, bjp, Europe, GBP, Sigma DP2 Digital Camera, The British Journal on August 21, 2009 by Nora McKeogh. The British Journal of Photography aims to raise international awareness about the threat of attack, arrest or harassment to photographers in the UK. A Flickr group pool of self-portraits can be found here. Updates on The Amateur Photographer’s ‘AP Rights Watch’ campaign to protect photographers’ rights can be found at www.amateurphotographer.co.uk. Brown’s ascent was reported at the time by the Telegraph’s Kate Day here, by the British Journal of Photography here, and by Amateur Photographer here [August 3]. You can see the video of Brown on the plinth here at OneandOther.co.uk. He has kindly shared his own view from the plinth with us. This entry was posted in Events, Photography, Press freedom and ethics and tagged Amateur Photographer, blue feather photography, fourth plinth, kate day, not-a-crime.com, OneandOther.co.uk, photographer, press freedom, spike brown, The Amateur Photographer, The British Journal, the Telegraph, Trafalgar Square, United Kingdom, www.amateurphotographer.co.uk, www.bluefeather.co.uk on August 17, 2009 by Judith Townend. “Two photographers have filed a legal claim against the Metropolitan Police after they were unlawfully prevented from reporting the protests outside the Greek embassy last year,” the British Journal of Photography reports. Photojournalist Marc Vallée and videojournalist Jason Parkinson are seeking an apology and damages from the Metropolitan police. Vallée makes the announcement on his blog here. British Journal of Photography story at this link. 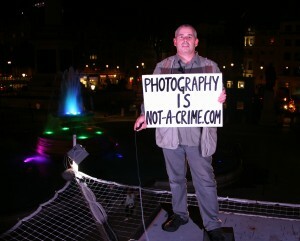 This entry was posted in Editors' pick, Journalism, Press freedom and ethics and tagged Greek Embassy, Greek embassy in London, greek embassy protests, jason parkinson, Journalism.co.uk, Marc Vallee, Met Police, Metropolitan Police, Photography, photojournalist, police officer, The British Journal on July 29, 2009 by Judith Townend. As reported by theregister.co.uk and the British Journal of Photography, new terrorism guidance for police officers has been issued. The National Police Improvement Agency (NPIA) has released its update ‘Practice Advice’ on stop-and-search powers, with reference to the Terrorism Act 2000. This announcement follows up from Marc Vallée’s assessment of the situation here and here. “The Terrorism Act 2000 does not prohibit people from taking photographs or digital images in an area where an authority under section 44 is in place. Officers should not prevent people taking photographs unless they are in an area where photography is prevented by other legislation. “If officers reasonably suspect that photographs are being taken as part of hostile terrorist reconnaissance, a search under section 43 of the Terrorism Act 2000 or an arrest should be considered. Film and memory cards may be seized as part of the search, but officers do not have a legal power to delete images or destroy film. “Although images may be viewed as part of a search, to preserve evidence when cameras or other devices are seized, officers should not normally attempt to examine them. Cameras and other devices should be left in the state they were found and forwarded to appropriately trained staff for forensic examination. The person being searched should never be asked or allowed to turn the device on or off because of the danger of evidence being lost or damaged. “What is going on here? Does Section 43 of the Terrorism Act 2000 override the long held journalistic protection of Special Procedure Material under the Police and Criminal Evidence Act (PACE)? 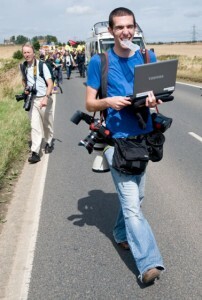 Pictured: A press photographer files images on the move as environmental activists march from the Camp for Climate Action to Kingsnorth Power Station Hoo, Kent, England on Saturday August 9 2008. 2,000 campaigners marched on the Power Station with the aim to shut it down for the day. (Photo Marc Vallée/marcvallee.co.uk) (c) Marc Vallée, 2008. “We welcome the publication of unequivocal guidance showing that the Terrorism Act does not prohibit the taking of photographs in public places. “The authorities must now ensure that police officers are aware of the limits to their powers. It must also be made crystal clear that the right to seize film and memory cards can only be used in the very exceptional circumstances where there are strong grounds for suspecting someone of being a terrorist. “If section 43 of the Act ends up being casually used by officers in the same slapdash manner as other parts of the legislation, it would seriously inhibit the ability of journalists to work in our cities. The police cannot routinely use anti-terror or other legislation to stop journalists in their lawful and proper work. Neither must they see these guidelines as a green light to seize journalistic material, the special nature of which is recognised by law. Marc Vallée wrote to the National Police Improvement Agency (NPIA). “Under the Police and Criminal Evidence Act, material such as a journalist’s notes, photographs, computer files or tapes are classified as Special Procedure Material, which have a higher level of protection than ordinary possessions,” he wrote. “The Practice Advice makes it clear that there has been no change in the law. Journalist material will continue to enjoy the higher level of protection offered under PACE. This entry was posted in Freelance, Legal, Photography, Press freedom and ethics and tagged /marcvallee.co.uk, british journal of photography, journalist, judge, Kent, Marc Vallee, National Police Improvement Agency, National Union of Journalists, NUJ legal editor, on stop-and-search powers, photographer, photojournalist, police officer, Power Station, press photographer, Ray Mincoff, stop and search, stop-and-search photographers, stop-and-search powers, The British Journal, United Kingdom on December 2, 2008 by Judith Townend.